Generation Y are much maligned. You’ve seen that vile talk show host, bullying kids who’ve just become parents. Whilst humiliation TV has become a popular genre these days, when it distorts people’s perception of the UK, it becomes a problem. 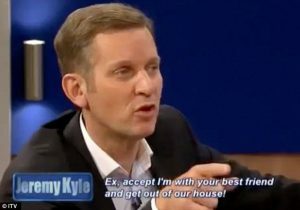 Jeremy Kyle is a pathetic man, who seeks pleasure from picking on kids, to boost his own ego. Swaggering about, he’ll shout, “Why don’t you listen to your parents ?” when that’s the last people the current teenagers’ should be listening to. the number of teenage girls falling pregnant in England and Wales, has reached its lowest level since 1969* ! Figures from the Office for National Statistics show conceptions in under-18s fell by 9.5 per cent to 34,633 in 2010. Pregnancies in under-16s also fell 6.8 per cent to 6,674. At the same time, the overall pregnancy rate has increased. Women in their 20s, 30s and 40+ are likely to be better off financially. This is where conception rates continue to rise. The sharpest rise is amongst women aged 40+, up 5.2 per cent to nearly 30,000. So back off knocking the younger generation Kyle !